I am developing old-style Windows Desktop Application in Delphi 7. Application has several settings parameters used in run-time. Application has a settings dialog windows, parameters initially are loaded from configuration (XML) file, and cached in memory. Originally there was possibility to change parameters only for current run-time session. Later I received requirement to allow to user possibility to save "somehow" optionally/explicitly changes to config file too. Is there a better.. or RIGHT/correct way to implement such logic? I think the problem is you are looking at the technological implementation instead of the user experience. The user generally doesn't care where they are saved, or how they are saved, only that they are saved. So instead of asking the user to deal with files, assume the user expects you to save them. It's then your choice of where to save them. Use a versioning system, at least keeping the prior saved state. Then, offer the user the chance to "Use previous settings?" or "Undo last changes? ", or even "Reset to defaults? Instead of a confirmation pop up after user has clicked the OK button, the better user experience would be adding a "Save changes to configuration file" check-box within the Settings window. User experience benefits include: 1. no annoying pop up after the OK action; 2. present all possible options when user is in Settings; 3. less clicks. that question box you've already use, but change the words, into: "Apply just for this session, or also make it default for future sessions?" and give three buttons "just for this session", "also for future sessions", and "cancel". 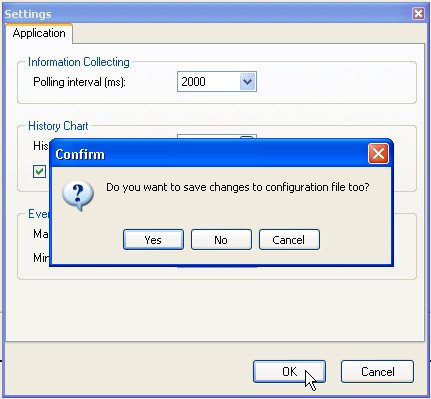 add a checkbox on the dialog box "don't ask me again (you can change this in the settings)". add a checkbox on the settings window "ask me about my preference on how to apply the settings." As per request, my comment as an answer. On windows it is common practice that when changing settings these are preserved from then on. Which means that the new settings should survive stopping and starting the application. And that in general means saving them to file or to a database. To be blunt: I would curse - and probably remove - any application that did not remember my settings from one session to the next. Not the answer you're looking for? Browse other questions tagged desktop-application save settings confirmation modal-windows or ask your own question.